Regardless, he downloaded the lyrics to the song and started singing them a lot. Then he had me find him flute music for it and decided he wanted to learn to play the song on the flute. Wow, he told me, it has [some large number of] measures—or whatever the thingys musicians play are called. And, he continued, it's hard to play. He tried and got stuck. I suggested to him that he try to learn the first four measures and once he had those, he should add four more and so on. He agreed that this was a good plan and his home practice sessions became dedicated to Coldplay. The next time I turned around, he was playing the whole dam song. I was not just proud, but amazed at his determination. Then he told me that there was going to be a first annual concert of some sort at his school featuring a bunch of music acts and he had tried out and his teacher knew another student knew the same song on piano, so he consciously coupled them and Sam was so excited and came home and ACTUALLY TOLD ME WHAT HAPPENED AT SCHOOL, to wit, "We sound awesome together, mom!" Much more practicing ensued until the concert last week. Unless you're related to Sam, you probably didn't watch that whole video, but I should tell you that it was awesome. I should also tell you that Jack and Quinn sat through the entire two-plus hour concert, which was pretty huge on their parts, so I'm extremely proud of my entire little family. I can't wait to see what song Sam asks me to download next. Ok, not related and I watched the whole video. Yeah Sam!!!!!!! That song isn't all that easy. Your advice to take it 4 measures at a time (also called bars) was very sound from a musical stand point. Good job wise mama! Be proud and keep showing his performance off. I'm looking forward to hearing more of him in the future. That was fabulous Sam! Note perfect and absolutely in sync with the pianist. It's like you've played together for years. Huge well done to you. I learnt to play the flute years ago and I would NEVER have been brave enough to do that. Difficult song too. So impressed, right to the end. That was fantabulous!!! I have a soft spot in my heart for pop music played on classical music instruments. YAY Sam! I did listen to the whole song. Good for you. You must be so proud of yourself. You were brilliant they way you suggested breaking it down! Your idea may have been the key to his success, well done mom! I did watch the whole thing, and I agree that they sound great together! I could listen all day! But (don't tell the piano player this) I think Sam was the star of the performance. I'm very impressed that he taught himself to play that whole song, and was brave enough to play it in public. And I envy him for being able to play such lovely music! I love that I'm not the only one who noticed that. :-) it definitely make me lol. Awesome! Love his smile at the very end! I'm not family and I watched the entire video!! One of my favorite songs, and he crushed it! Such an awesome job! Thank you so much! I'm super proud! 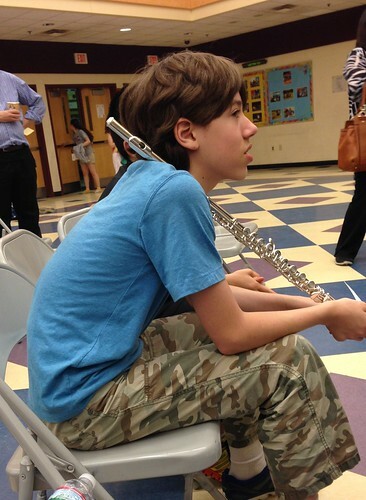 It is amazing to me how brave he is about performing on his flute. He truly, truly loves it. Yay! It's one of Sam's favorites now too. And our entire family has been constantly humming it because we've heard it so much lately. He did a great job! I remember you posted another video of him playing a while ago, and it's cool to see how much he's improved since then. Not related to Sam, but flute's a commonality between us, so I watched it. I was about nine when I got my flute.